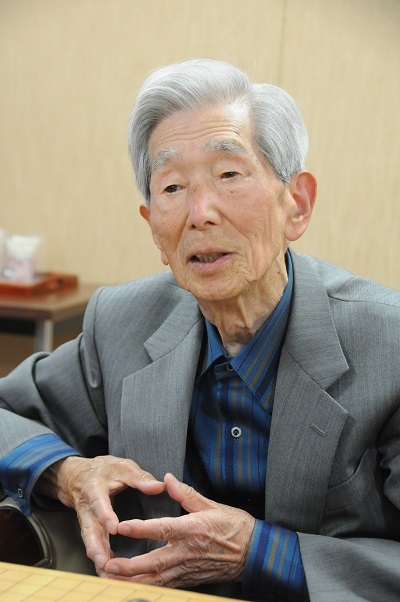 Sugiuchi Masao (杉内 雅男, 1920–2017) was a Nihon Ki-in professional Go player who reached 9-dan in 1959. Sugiuchi was called Go no Kami-sama (literally the 'God of Go') for his ultra-serious attitude. He was married to Sugiuchi Kazuko (née Honda) who is also a professional go player (8-dan). He won the the Tokyo Shinbun Cup in 1962 and the Hayago Meijin in 1959. He unsuccessfully challenged Takagawa Kaku for the Honinbo title in 1954 and 1958, and Kobayashi Koichi for the Tengen in 1976. He and his wife attended the seventh U.S. Go Congress in Rochester, NY, in 1991. In early 2015 he was still active and playing in the Gosei premilinaries. His opponent in the game was Tsuneishi Takashi 2p, more than 70 years his junior. According to this link ( http://www.lifein19x19.com/forum/viewtopic.php?p=180219#p180219) his record for 2014, at age 94 was 5 wins and 6 losses. On March 10, 2016 he played 15-year old Ohnishi Ryuhei 1p, 80 years his junior, in the Oza preliminaries as reported on the Nihon Kiin's website ( http://www.nihonkiin.or.jp/match_news/match_info/801595.html). He passed away on 21 November 2017, with a lifetime record of 883-677-12-2, having become the oldest active Go professional in history.